The Uruguayan government will host a regional consultation for the UN Global Study on Children Deprived of Liberty on October 25th in Montevideo, Uruguay. 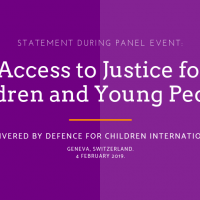 Government officials, regional child rights experts, and civil society representatives will participate in discussions of children deprived of their liberty in the administration of justice and institutions as well as those detained with their parents. DCI IS Geneva and DNI-Uruguay are proud to co-organise this event.